To celebrate the release of Avengers: End Game, we’re teaming up with our friends at Third Eye Comics for a comic book themed flash tattoo day! Saturday, Apr 27th from 1:00pm - 9:00pm we’ll be tattooing smaller, pre-designed, comic book inspired tattoos! No appointments for this event - walk-ins only. This is on a first come, first served basis which means we could fill up before 9:00pm. 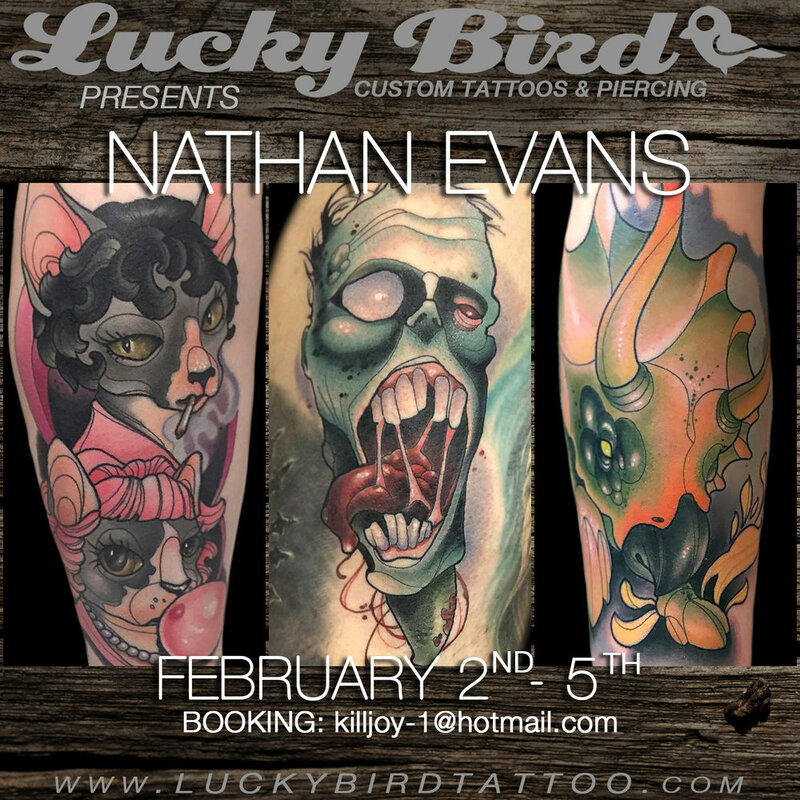 We’ll continue signing up clients until the time slots are filled so we recommend arriving early to secure your spot and get an awesome tattoo! Third Eye Comics will be giving out free Avengers comics for everyone that comes out. We’ll also have a few Third Eye logo tattoo designs available as well. Any client who gets a Third Eye tattoo will receive VIP access to their Free Comic Book Day on the following Saturday, May 4th!! Vip access includes jumping to the front of the line and receiving a full set of all 50+ FCBD comics. We’re so excited for this event and hope to see everyone come out! We do not post the flash designs in advance to avoid spoiling all of the fun on the day of - just like waiting for Christmas morning! We’ll have three of our artists participating in Comic Book Flash Day that include Parry Chotipradit, Shannon Taber, and Shana Hall! Please contact the shop if you have any questions or concerns. February Special! $100 OFF Microblading Service!! To welcome Kyndall Cramer and Microblading services to our shop, we’re running a February Special for our clients! Call or stop by between 1/18 - 2/1 and book a microblading appointment during the month of February and receive $100 OFF!!! This is a HUGE deal!! We’re committed to making beautiful people even more spectacular for the month of Love! Contact us now! Special ends on 2/1. Microblading is a tattooing technique in which a small handheld tool made of several tiny needles is used to add semi-permanent pigment to the skin. Depending on skin type, lifestyle, skincare routine, and aftercare these beautiful new brows can last 1-3 years. Please welcome Kyndall Cramer to our Lucky Bird family!! Kyndall is our PhiBrows certified microblading artist. She is extremely knowledgable with skin care and makeup application from prior professional training through esthetican school. Kyndall prides herself on her diligence and attention to detail and loves being able to help accentuate her clients’ beauty. Microblading is by APPOINTMENT ONLY. All Day - For every $100 Gift Card or eGift Card purchase, receive $20 FREE! Also, all online and in-store merchandise will be 20% off! Use promo code: BLACKFRIDAY to receive discount!! Don’t miss out on this great opportunity for you or your loved ones this holiday season! Mickey Mouse Flash Tattoo Day! We’re celebrating Mickey’s 90th birthday with a collaboration flash tattoo day of Mickey Mouse and Disney inspired tattoos! Shannon Taber, Shana Hall and guest artist Chris Edge will have pre-designed flash tattoos available from 1pm-9pm on a first come, first served walk-in basis. Also available, “Get What You Get” designs where you can purchase $100 flat rate pre-determined designs by blindly choosing a number out of our Mickey Mouse Magic Pumpkin. $100 to play, $60 to replay. Meaning, you can pay $100 to blindly choose a design or you can pay an additional $60 to draw again. Follow Shannon Taber, Shana Hall and Chris Edge on Instagram to see previews of the designs that will be available on November 16th! This is going to be so much fun and we hope that you all will come join us and celebrate the day with Mickey! We will be CLOSED on Monday, 9/3/18. However, to celebrate Labor Day we will be offering 10% off eGift Card purchases ALL DAY! Just go click on the "Gift Card" button in our navigation bar and enter the promotional code: LABORDAY to receive your discount. We hope everyone enjoys the long weekend and is able to take advantage of this sale! The 11th annual Baltimore Tattoo Arts Convention is coming up!! Friday, May 4th - Sunday, May 6th at the Baltimore Convention Center in downtown Baltimore. All of our artists will be together plus a few extra close friends of ours this year! Check out the site for more information regarding hours, pricing, accommodations, and more! If you are interested in booking an appointment with one of our artists at the Baltimore Tattoo Convention, please contact them directly by clicking their image below. FRIDAY THE 13th FLASH TATTOOS!! This coming Friday, April 13th we’re offering custom horror flash tattoos by Parry Chotipradit, Shannon Taber, Shana Hall & Nicky Hennerez!! Prices will start at $60+. No appointments. This is walk-ins only starting at 1:00pm until we are booked for the day! Get here early!! This is a first-come, first-served basis. If we do end up booking the day early, we will still offer to sign up clients on a "call back" list for the off chance that clients start dropping out or if we finish with more time to spare. Everyone always asks to see the flash designs in advance, but unfortunately we do not want to spoil the surprise! That takes all the fun out of coming to the shop and hanging out! We will try to post some sneak peeks of the designs but we would rather encourage everyone to come out to shop the day of to see what we have to offer. As many of you already know, Jeffy Scott & John Guzman have closed their books with Lucky Bird Tattoo and are moving on with new chapters in their lives. We always hate losing an artist but we are really proud of these guys and wish them best of luck with their new endeavors! Jeffy Scott is relocating to Wunderland Custom Tattoos in Gainesville, FL. John Guzman is relocating to Black Wolf Tattoos in northern Georgia. Please contact the shop if you have any existing deposits with either Jeffy or John. These gentlemen plan to return frequently for guest spots as we will keep everyone posted. Feel free to reach out to either artist if you have any questions. Download our FREE mobile app! This app is only available on the App Store for iOS devices. In this app you can find our shop hours and location, Artist Portfolios, Special discounts/Coupons for App Users, push notifications for current cancelations or artist availability, direct links to our social media sites, Aftercare Instructions and more!